**UPDATE this card class is sold out. Thank you for your interest in my classes to go! I will have another next month. I am soooo excited to offer you another Card Class to Go! 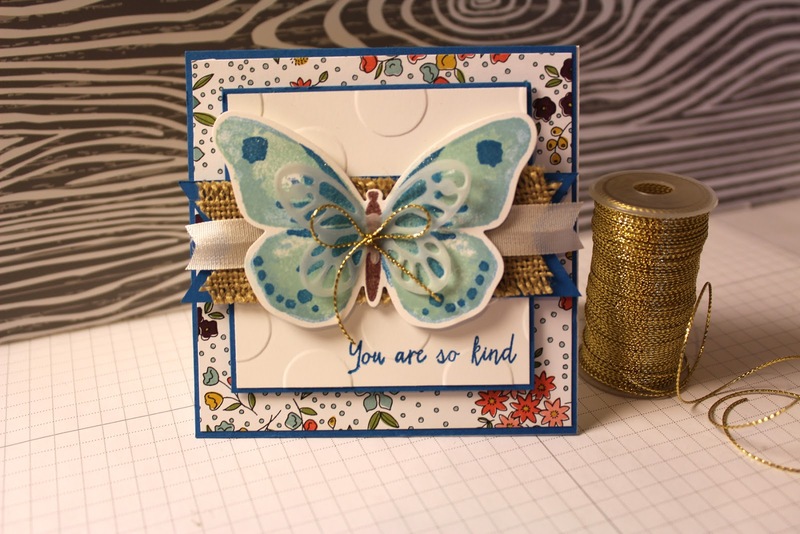 This class features the newly released Love and Affection stamp set, Affectionately Yours DSP and the brand new, super exciting Copper Embossing Powder! Also included in the class will be written instructions to create 4 Note Cards and a Note Card box to hold them in. I think you are going to LOVE it! 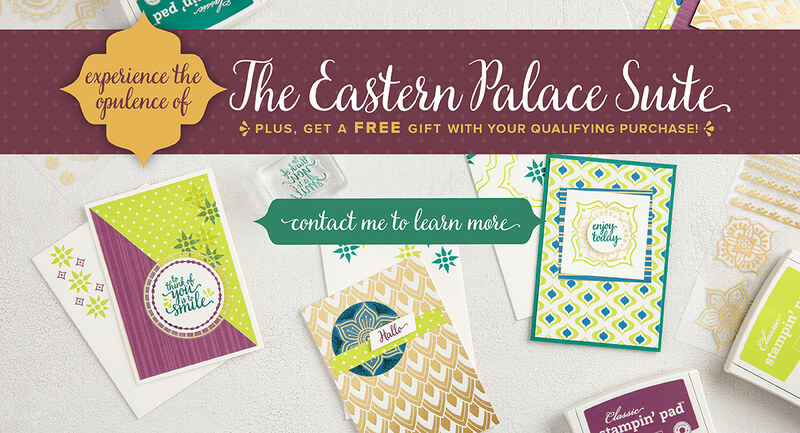 If you haven't seen the stamps and paper, it's a must to add to your card making essentials. The class will also use the Night of Navy Ink and VersaMark Ink. Please let me know if you would like to add these to your order! I also have been working on my very first LIVE workshop! Where we will be making the cards from this Card Class to Go. My LIVE class is currently filled, but if anyone lives in the St. Charles MO area and is interested in future LIVE classes, let me know. I can add you to the invite list. If you are interested in the Love and Affection Class to Go, please click the link below and it will take you directly to paypal to sign up. 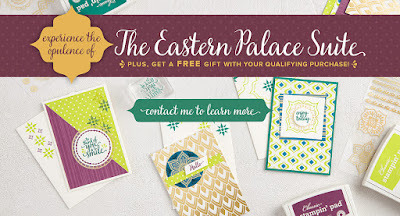 Let's celebrate the new catalogue from Stampin up! First, I want to thank all of you who purchaed my last "Class to go". It was a great success! Now, for another "Class to go" using a NEW stamp set from our new catalogue that goes live June 1, 2016. It will be called Love and Affection, using the new DSP Affectionately Yours and stamp set Love and Affection. I will be posting the details on June 1st. I can't wait, I hope you feel the same way! Hi Stampers! I have a beautiful card to share with you today! I have to say, I totally CASED this from Pinterest! When I saw the pin of this card, I knew I had to make one! I LOVE the bright colors! I used the Rose Wonder die and cut the large rose and 2 of the smaller roses from black cardstock. Then cut the large rose from Rose Red and Cucumber Crush and began to piece the colors into the black die. This was a little time consuming, so I probably won't make this type of card to frequently, but it is stunning! The 2 smaller roses were pieced using Daffodil Delight and Island Indigo. After layering all the pieces together, I then add A Wink of Stella in clear to all the rose petals..this really gave it a shine! Thanks for stopping by today, and don't forget about my newest "Class to Go" Helping Me Grow. The class includes the stamp set, 2 inks and a blender pen. I included for FREE all the material's needed to make 3 projects using the stamps and inks in the kit. Hi Stampers! I wanted to share a card with you that I recently made for a friends birthday. This card uses the Hostess Stamp set Best Thoughts! I LOVE this image! It is so fun to color with either Stampin UP ink, or Copic Markers! I stamped the image with Stazon Black Ink and colored in the flower using Rose Wonder and Pear Pizzazz. I also stamped the same flower image on the Rose Wonder cardstock using VersaMark Ink and then clear embossed it. I love the little POP it gives the card. I also drew a box around the image using the Black Stampin Up marker. If you are interested in this stamp set, ACT NOW! It's retiring the end of May and the only way you will be able to get this set is to be a hostess of a party before May 31, 2016. Please drop me an email at Cynthia.burgess@att.net if you are interested in being a hostess and receiving this stamp set FREE! Also don't forget about my "Class To Go" using the Helping Me Grow stamp set! Check out the post below for more information. Hi Stampers! I am back with another really fun Class to Go for you! This class features the Helping Me Grow Stamp set from Stampin Up, Blender Pen and 2 colors of ink - Daffodil Delight and Calypso Coral. I really love this stamp set, and I think this is such a GREAT class. All for $48.00....but I'm not done there! I will include for FREE the following so that you can make 3 projects as soon as you receive your stamps and ink! Cardstock to make 3 projects. Cut, and scored. Complete instructions for all 3 projects. Now to see a picture of the projects!!!! As you can see, this class includes complete instructions and enough product to make ALL 3 projects! Black Ink (preferably Stazon), adhesive, Wink of Stella (optional), piercing tool and Stampin Dimensionals. If you need to add any of these items to your order, please let me know. Perfect for Mothers Day, Teacher Gifts or any time you need to say a "Special" Thank you to someone! with your name, email and phone number. I will reach out to you personally and complete your order and make sure you have your goodies as quickly as possible. This Class TO Go will offered for a LIMITED time only! Thanks so much for looking and have a most WONDERFUL Day! I have had so much trouble trying to upload the tutorial to this page....so for right now, if you interested in the tutorial for the Watercolor Wings card, please leave a comment in this post with your email address (I won't publish the comment) so I can send directly to you. I hope to have this figured out soon! Hi my crafty friends! I am back with a new card. 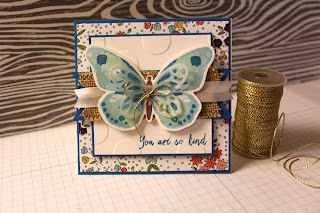 For this card I am using Stampin Up's Watercolor Wings stamp set....which I LOVE! I am working on the tutorial and hope to have it posted in the next day. I will update this post when I have it ready to go. In the meantime, hope you like the eye candy! Hi crafty friends....I wanted to pop in for a moment and give you an update, as I have been out of pocket for a few weeks. I have been super busy at work, and getting ready to do some heavy traveling in the month of March. But I do want you all to know what I have been working on! I will be providing FREE tutorials each month highlighting a Stampin UP stamp set. I am currently working on a card using the Watercolor Wonder stamp set, that I think you all will LOVE! I sure do! I hope to have it up on the blog by end of week. So just hang on, and stay with me...I promise I will get better at blogging and providing inspiration on using Stampin Up products! Hello my crafty friends! I have a few cards to show you today. I have been busy creating away with some of the new SUPER CUTE stamps I have gotten from Stampin UP in the past few weeks. Isn't this little chick the cutest! This card was made using two of the Sale-A-Bration FREE stamp sets Honeycomb Happiness and Perfect Pairings. Who doesn't love free stuff! I DO! I did color this cutie with Copic markers, as I still am a Copic girl at heart. I will try different techniques' but, I love my Copic's! This card was made using one of the Sale-A-Bration FREE stamps sets as well, Flowering Fields! I colored this one with Copics, and used the Sale-A-Bration FREE paper for the background, Wildflower Fields Designer Series Paper. And for my final card today, I TOTALLY CASED this card from the Occasions Catalog! I just loved it so much! I used Birthday Blooms stamp set and the Birthday Bouquet Designer Series Paper! Sometimes you just have to CASE a card you LOVE! If you are interested in any of the products, you can visit my Stampin Up page at the top of the page. The Crafting class to go has sold out. Thank you ! I will be offering another class next month. Are you ready for a sneak peak of the upcoming "Crafting Class To Go" I will be offering using Stampin Up products. And I will include all the materials and instructions needed to make the 4 projects sneaked peaked above for FREE. All you need to provide is black ink and some form of adhesive. The projects are a card and envelope, treat bag, tag and treat holder and the treat tube that fits into the holder. All the things you need for your next fun birthday party! I am expecting the class to fill up FAST, so make sure you get your seat reserved. You will need to send me an email to request your spot in the class. I will send you a PayPal invoice once I have received your request. I am so super excited to be starting these classes! I love to create fun projects and I want to share them with you! If you would like to add anything additional to your order, please let me know in your seat reservation request.